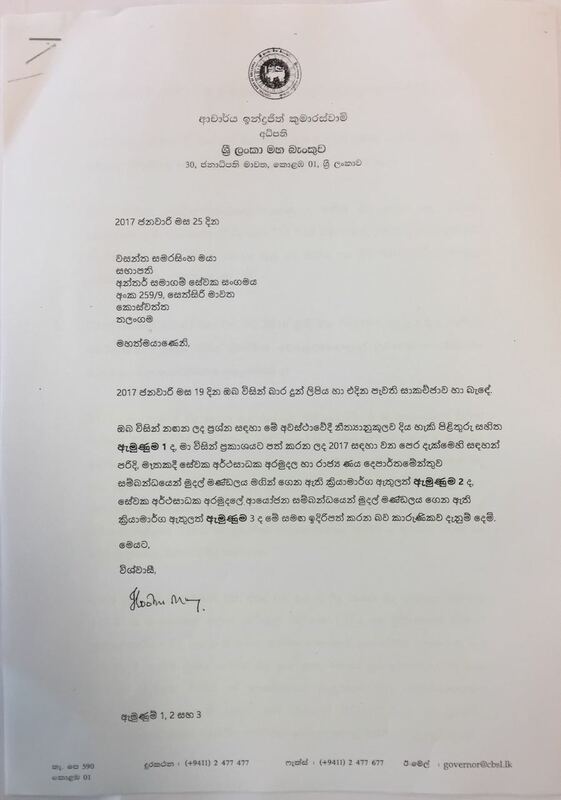 Government Medical Officers’ Association (GMOA) has decided to complaint to the Inter-Parliamentary Union that Ministers Rajitha Senaratna, Lakshman Kiriella and SB Dissanayaka without fulfilling their official responsibilities are abusing their ministerial powers to put lives of patients at risk. 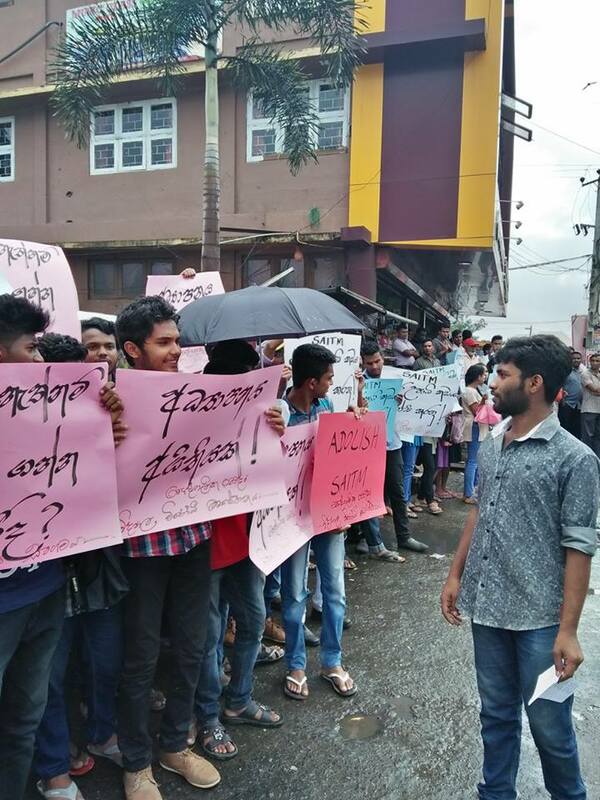 They also would take measures to complain to the President, the Prime Minister and the Speaker against the three ministers said the General Secretary of GMOA Navin de Soyza. When sworn in Ministers declare that they would obey the law of eh country and protect rights of the people. However, the particular three ministers violate the oath they take said Dr. Soya at the press conference held in Colombo yesterday (16th). 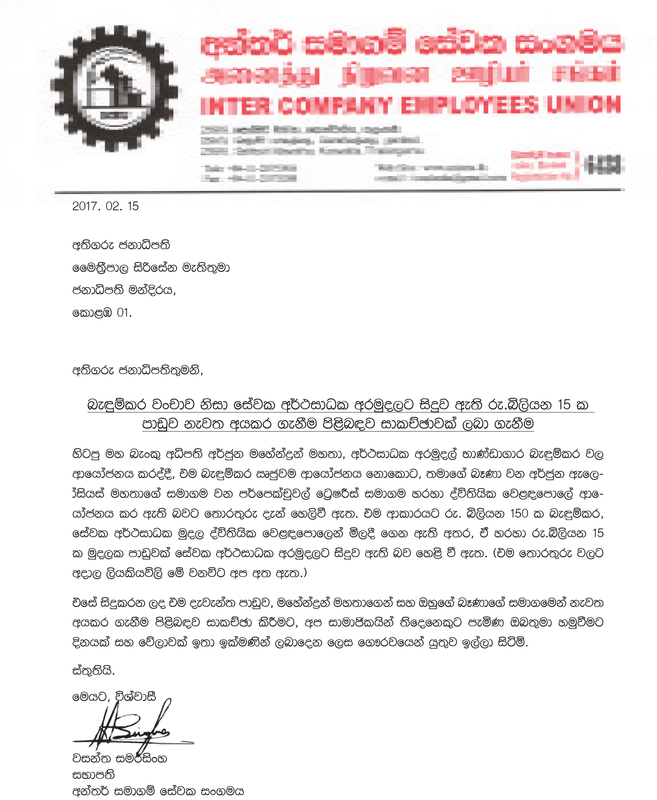 The Inter Company Employees’ Union (ICEU) has sent a letter to President Maithripala Sirisena requesting him to give them a discussion to show how Rs.15 billion plundered from the EPF through Central Bank bond scam could be recovered. 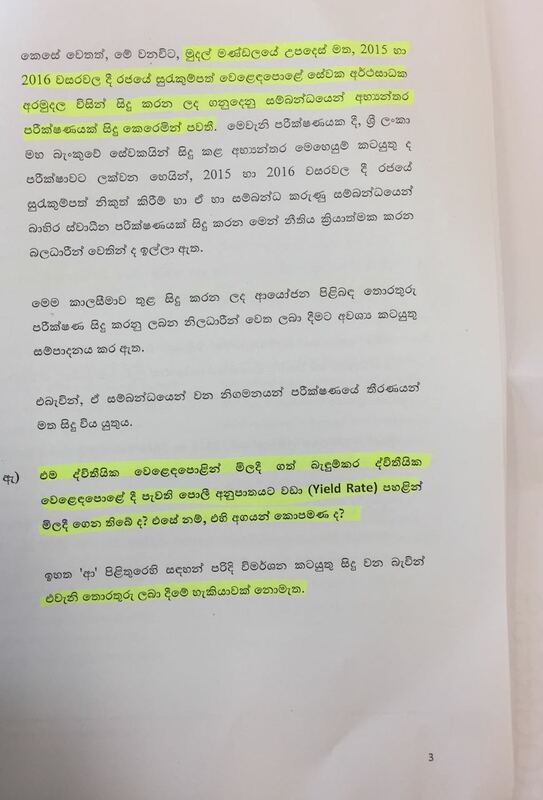 The President of Inter Company Employees’ Union Wasantha Samarasinghe in his letter dated 15th states his union possesses clear written evidence to prove that the bond scam has incurred a loss of Rs.15 billion to EPF. 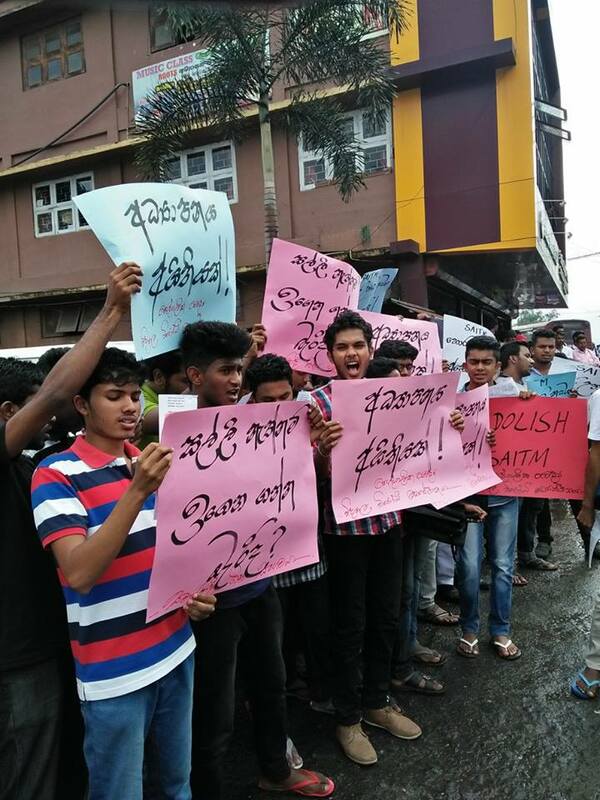 He further states the response to the letter sent by the Union to present Governor of Central Bank Indrajit Kumaraswamy also show how the action of former Governor Arjun Mahendran had incurred the loss to the EPF. Tamil Nadu Governor Vidyasagar Rao today (16th) appointed AIADMK legislature party leader Edappadi K. Palanisamy as the Chief Minister. The Governor has asked Palanisamy to seek vote of confidence in 15 days, the Raj Bhawan said in a statement. Tamil Nadu Minister D. Jayakumar said the swearing-in ceremony of Palanisamy as the Chief Minister will be held later today. A two-judge bench of the Supreme Court on Tuesday convicted AIADMK general secretary V.K. Sasikala in connection with a 19-year old disproportionate assets case. She also will not be able to contest elections for 10 years or hold public office. Former Tamil Nadu chief minister late J. Jayalalithaa, Sasikala and her two relatives, Ilavarasi and Sudhagaran were convicted in the case that alleged that the former chief minister owned assets far exceeding her known sources of income. Former Crimes OIC of Narahenpita Police Sumith Perera has been released on bail by Colombo High Court Judge Manilal Vaidyathilaka. today (16). The Former OIC was released a cash bail of Rs. 100,000, three surety bails of Rs. 1 million and he was also banned from travelling abroad. He was also ordered to be present before the Crimes Investigation Department (CID) ones a month. The former Crimes OIC was arrested and remanded in connection with concealing information relating the Wasim Thajudeen murder. 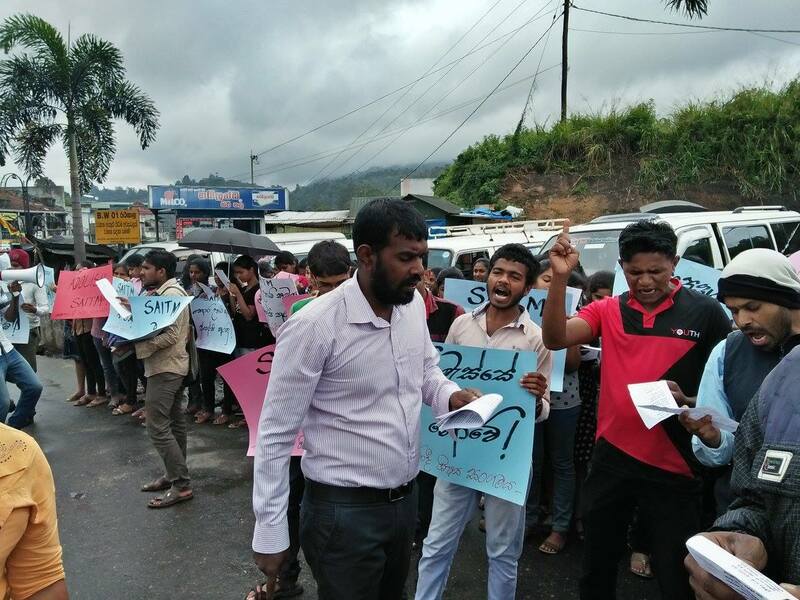 The Department of Cooperatives has taken measures to hold an inquiry regarding malpractices that have been committed in the Education Services Employees thrift and Credit Cooperative Society (EDCS) during the four year period from 2011. The Commissioner of Co-operative Development and Registrar of Co-operative Societies Mr. D. Jeevanadan said the malpractices that had been committed from 12.05.2011 to 06.11.2015 would be carried out on a request by the EDCS. Mr. D.S.S. Mendis of the Department of Cooperative Development has been appointed as an inquiring officer while K.L.S. 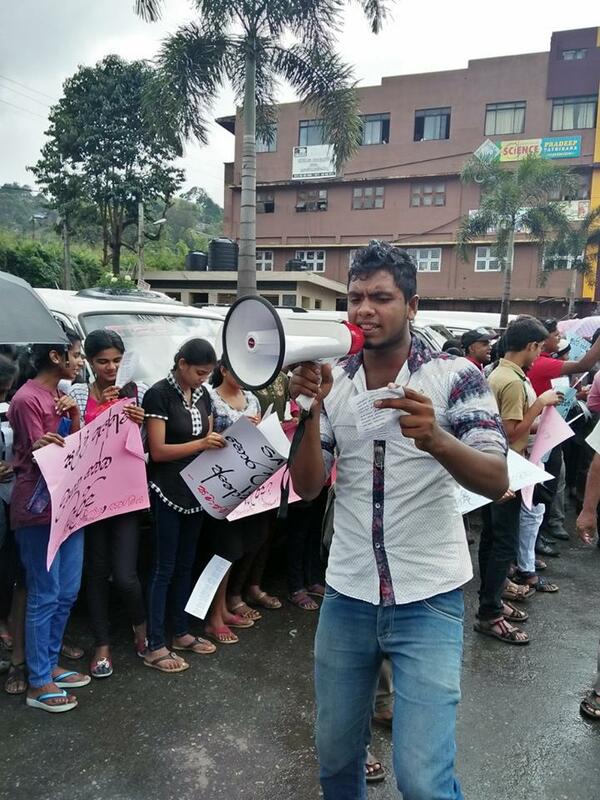 Malkanthy, K.K.C. Prasad and M.A.I.D. Marasinghe have been appointed as other officials of the inquiring committee. 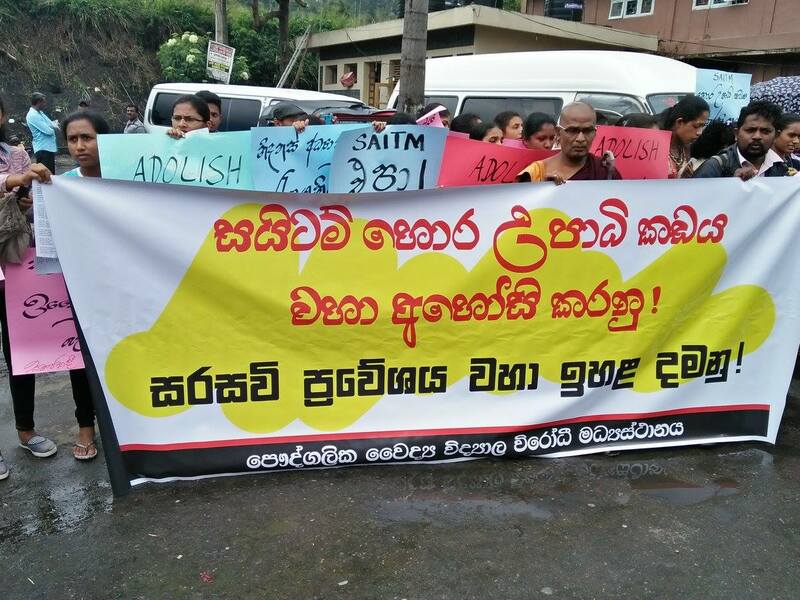 Anyone could submit their views in writing or orally on malpractices that have been committed in EDCS at the inquiry to be held at the head office of the EDCS. Malpractices have been committed and cooperative regulations violated when registering suppliers, buying stationary, printing, recruiting employees, giving loans, repairing vehicles states the committee. 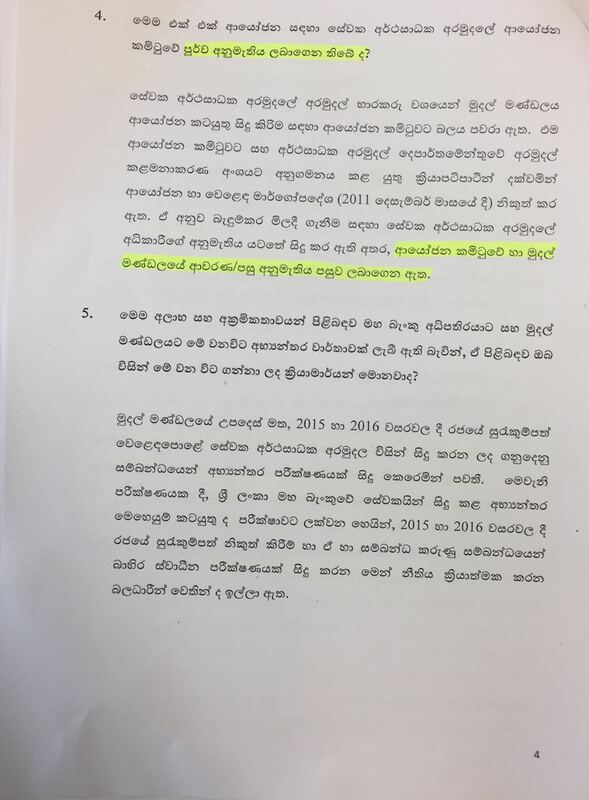 When the President of the Education Services Employees thrift and Credit Cooperative Society (EDCS) Priyantha Liyanage was asked about the inquiry, he said the Director Board of the EDCS has requested an inquiry into financial irregularities that have been committed in the Society from 12.05.2011 to 06.11.2015 so that perpetrators could be punished. He said financial reports for the period have been destroyed and interim boards had been appointed illegally during the period. 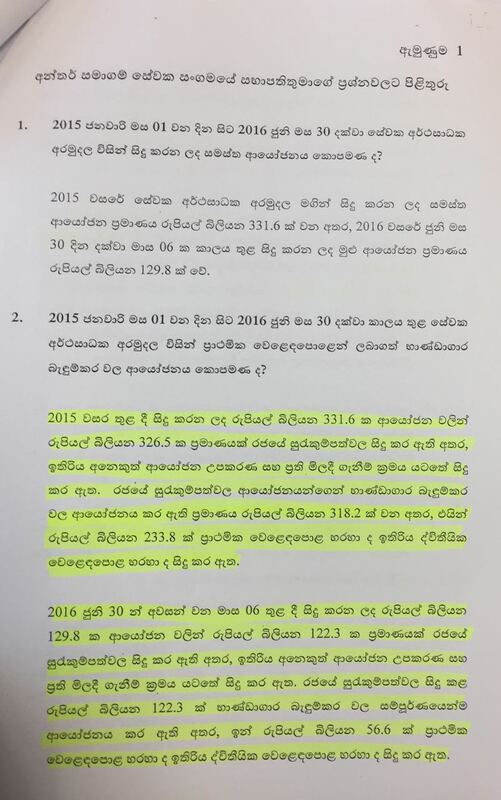 The latest report presented in Parliament by the Committee On Public Enterprises (COPE) reveals that during 2013 – 2014 period nearly Rs.20 million had been taken from a loan obtained to develop roads by Road Development Authority (RDA) to construct a President’s House at Embilipitiya. 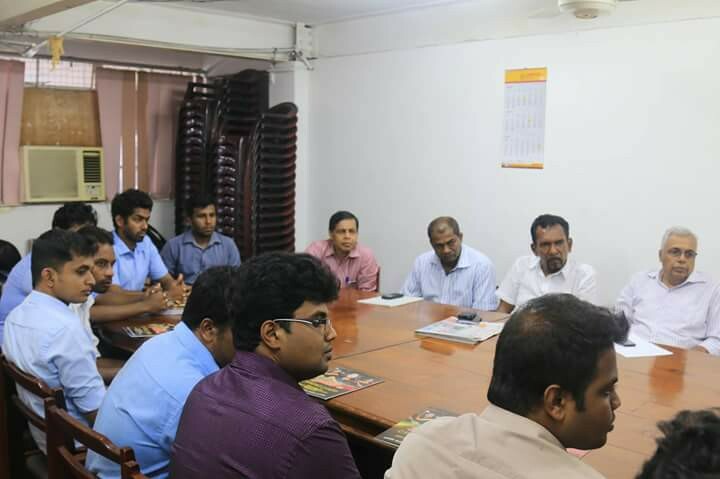 The report was presented in parliament by the Chairman of COPE JVP Parliamentarian Sunil Handunneththi. 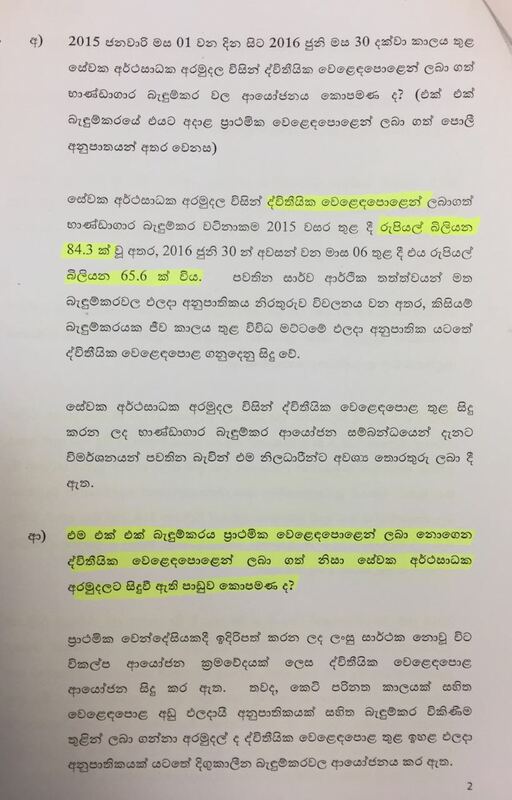 COPE report states money used for other affairs other than the project it was intended for would be disadvantageous and also it would have to be settled by the Treasury. Meanwhile, COPE investigations have revealed that more money than the estimated amount has been spent in broadening 64 roads using funds from local banks. COPE also states there are issues regarding the standard of the work carried out on the relevant roads. 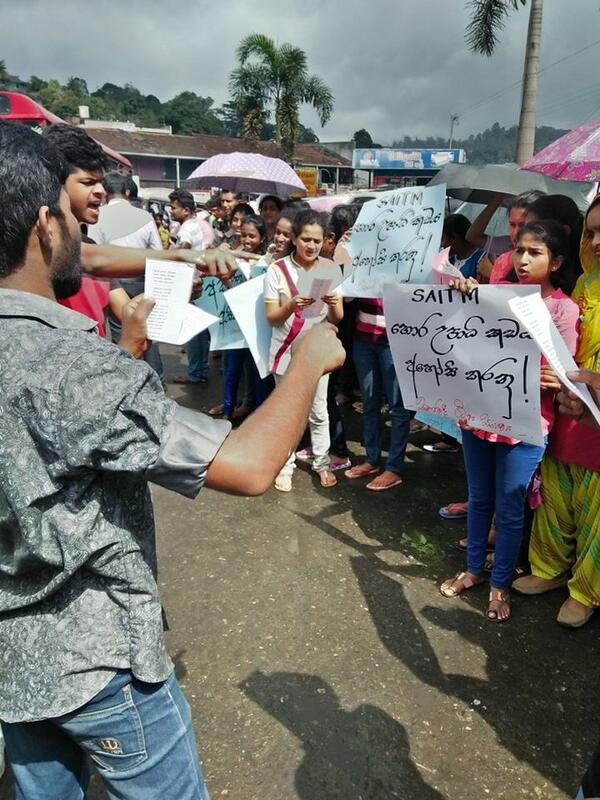 An agitation demanding the government to stop the deceitful strategy of legalizing the illegal degree awarding SAITM medical school and close it down was held at Bandarawela. 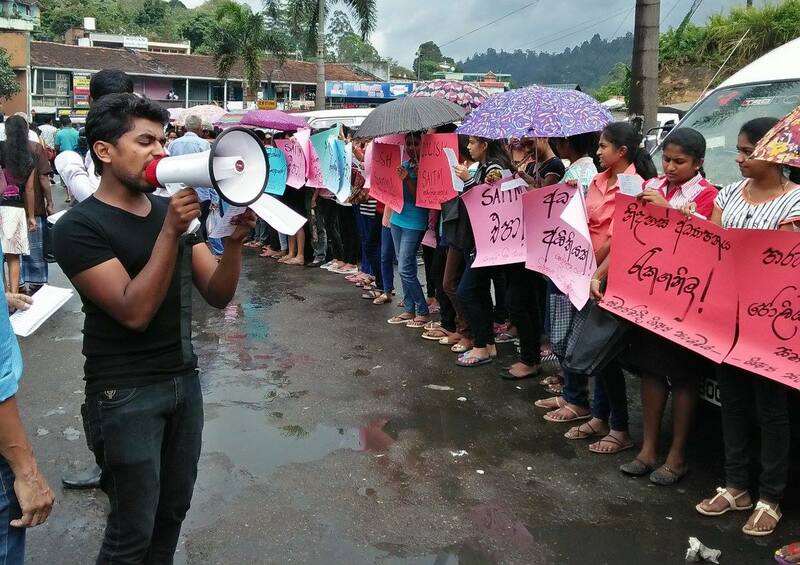 The agitation jointly organized by Socialist Students’ Union and Center to Oppose Private Medical Colleges was addressed by the Divisional Secretary of Lanka Teacher Services Union Wasasntha Sanjeewa and Ranga Upekshana of Socialist Youth Union. The minister had taken the bicycle to the press conference to set the right example, but was left empty-handed. The Minister had taken the race bike to the press conference in Halle (south-west of Brussels) but had an unpleasant surprise afterwards. His two-wheeler turned out to have vanished. “I locked my bicycle properly. The press conference was not far from where I left it, but apparently somebody managed to steal it. We hope to use CCTV footage to catch the thief, and to have him account for his deeds”, Weyts told media. 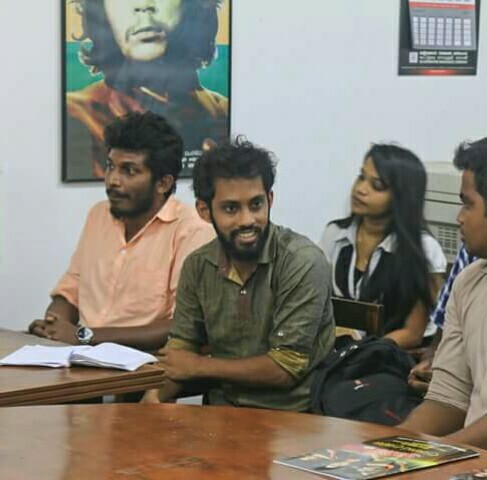 The Deans of all 8 Faculties of Medicine in Sri Lanka universities have released a joint press statement regarding reports that were published that they had agreed after a discussion held with education authorities to certain conditions that would allow SAITM illegal degree selling medical school to be legalized. The statement, issued by the Presidents of Faculty of Medical Teachers Associations (FMTAs -Trade unions) of the eight medical faculties under the UGC states they do not agree with the verdict of the Court of Appeal ordering the Sri Lanka Medical Council (SLMC) to grant provisional registration to students of SAITM and fully endorse and support the decision by the SLMC to challenge this verdict in the Supreme Court of Sri Lanka. 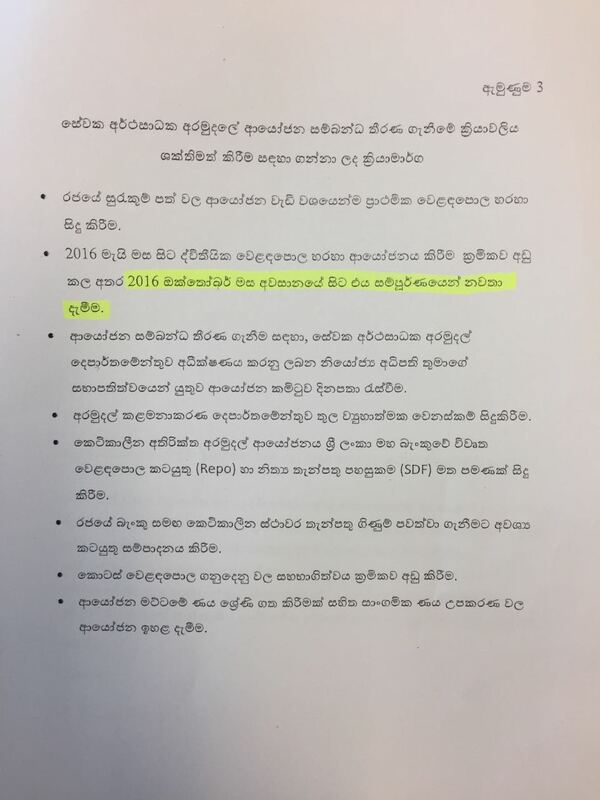 Condemning the document titled “Expansion of Medical Education in Sri Lanka with the Participation of the Private Sector: Adopting the South Asian Institute of Technology and Medicine (SAITM) as a Model” Presidents of Faculty of Medical Teachers Associations state an institution such SAITM established in a fraudulent manner should NEVER be adopted as a model for private medical education. 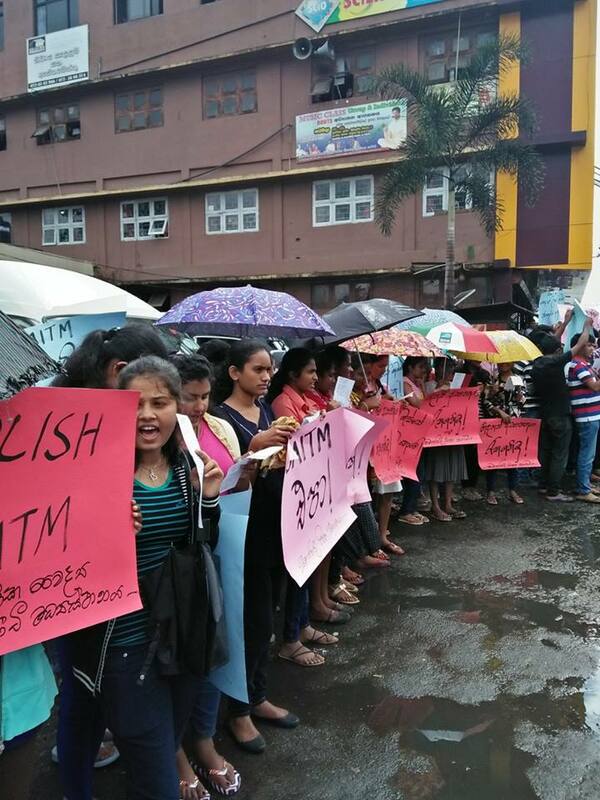 The statement states SAITM is on a path of raking in large amounts of money at the expense of providing a quality education. 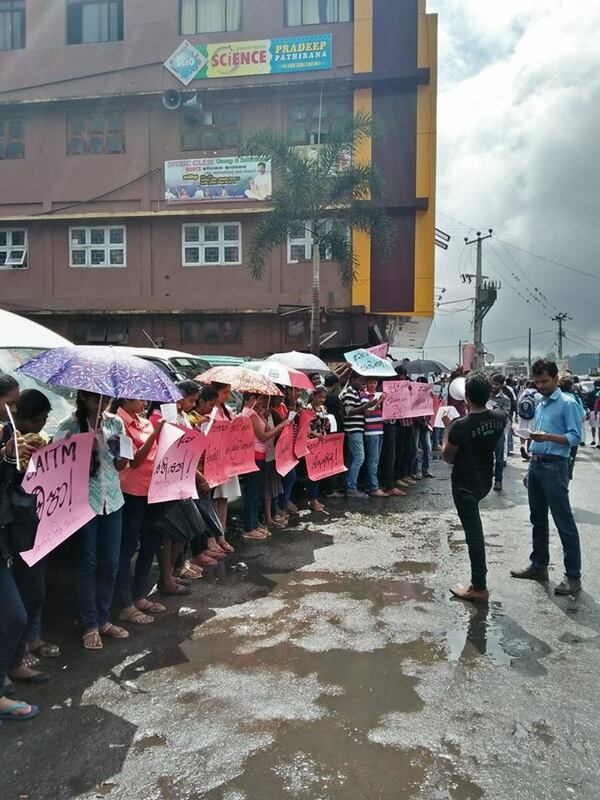 The FMTA is against such admission of uncontrolled numbers of students. 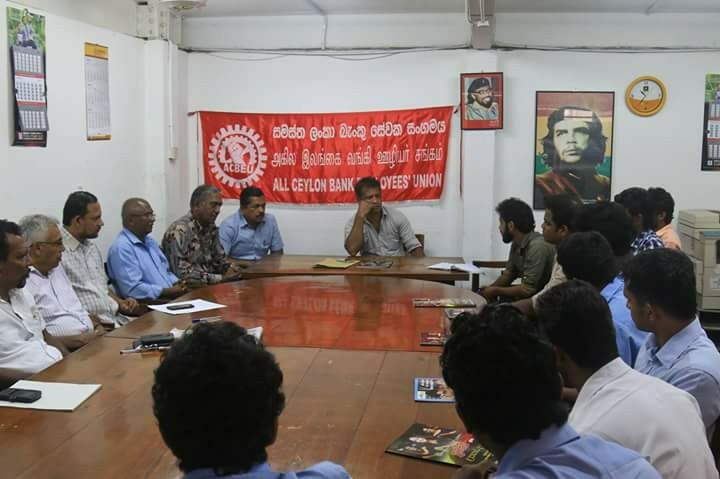 Representatives of ‘Students & People’s Movement to oppose SAITM’ held a discussion with the President of National Trade Union Center (NTUC) at All Ceylon Bank Employees’ Union head office at J.R. Wijeyawardene Mawatha today (15th). 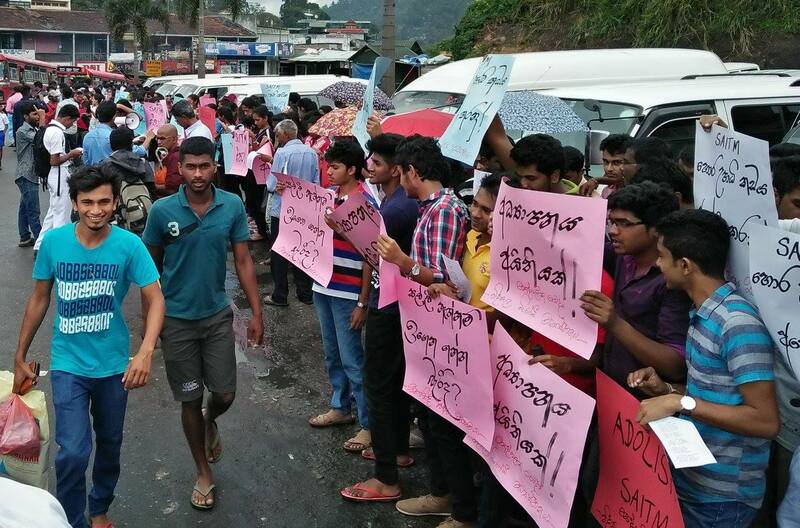 Both parties have decided to continue the struggle until SAITM illegal degree awarding medical school is abolished and have agreed to launch several national level moves against SAITM in the near future. 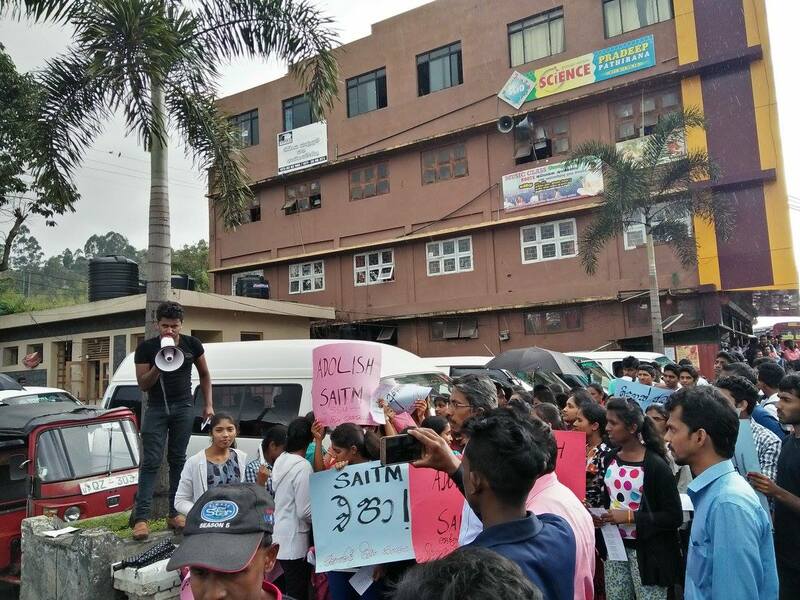 Despite various parties express different views regarding SAITM the ‘Students & People’s Movement to oppose SAITM’ carry out their protest campaigns with the view that SAITM illegal degree awarding medical school should be abolished. 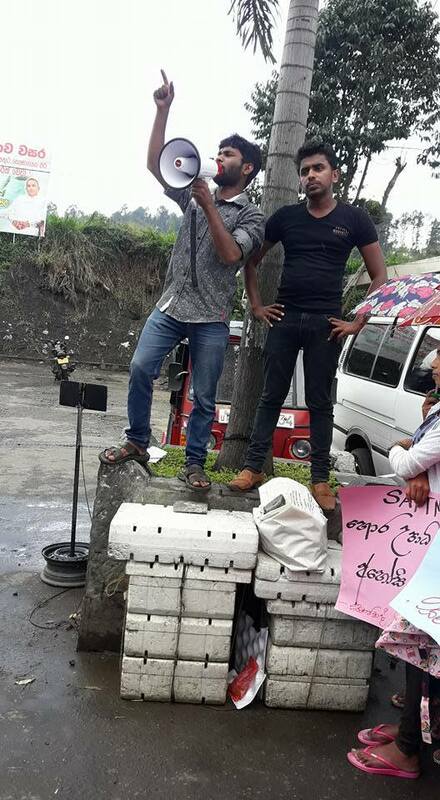 They also said they would accept a just solution put forward by Sri Lanka Medical Council. It was also decided to apprise state and private sector institutions and worksites with the participation of both parties.